Stansted is well placed to take on new business. Throughout the recent hoo-hah about airport capacity in the south-east, one simple fact has been under-reported – there isn’t a shortage of capacity in the south-east. BAA’s own chief financial officer was reported as recently as April 2012 saying that Stansted is “only half full“. 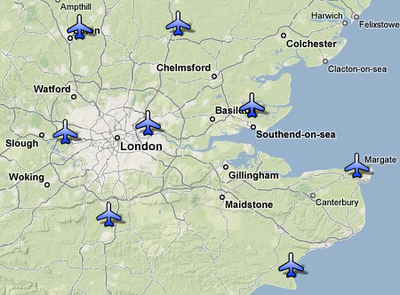 Both Stansted and Manston have spare capacity, long runways, and are in the “aviation-hungry” south-east. So why would Infratil balk at spending a few million a year at Manston, but leap at the opportunity to invest a BILLION in Stansted? The answer, of course, is in the question – it’s the difference between “spending” and “investing”. And this is also the answer to those who ask why not Manston. Manston isn’t Outer London. It’s out of London. Well, there are several airports that have leapt on the global branding bandwagon and smuggled the word ‘London’ into their name, with varying degrees of geographical accuracy. So, JBLA to one side, what are we left with? Well, starting from where London actually is, you can see that London City is pretty much a slam-dunk – 9/10 for accuracy. Spiralling out clockwise from the south, we have Gatwick, Heathrow, Luton, Stansted, Southend and Manston. Yes, folks, Manston’s even further from London-land than the fantasists at Lydd. ‘Location, location, location’ does matter and this seems to be a persistent blind spot for many when it comes to discussing Manston’s viability. It may have a lovely long runway, but it’s in the wrong place. Draw a circle with a 20, 30 or 50 mile radius around all the ‘London’ airports, and Manston’s circle will have the least land in it – because it’s on a peninsula. In terms of population within the catchment area, it may just nudge ahead of Lydd, but will always be well behind the others. It’s not a great place for a high volume passenger airport. Not that great for freight either, being so far from the highest densities of people and industry. On with your thinking cap, dear reader, for soon I will be asking for your best efforts on two topics: how would you make a sustainable success out of Manston as an airport; and how would you make a sustainable success out of the Manston site as a non-airport. Posted: Tuesday, February 13th, 2007. Filed in General News.